Full color full color foil business cards. One or two sides on 16 pt card stock. Full color and full color foil all over or where you need it. Cards can be UV coated for the high glosss finish and extra protection or a sleek NON UV matte finish. Minimum 500. Full color foil flyer printing: This is the premium top shelf of full color print. This job will give that extra class that no other printing material can do. If you have premium clients or just want to stand out this is the best thing. 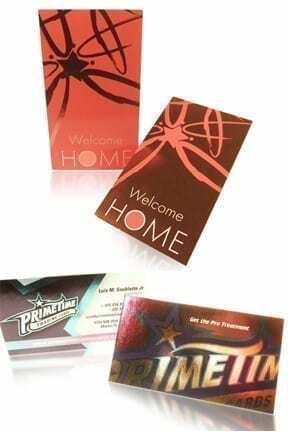 You can get your regular full color print and add full color foil all over or only where you need it to add that extra style, this is truely a unique item. The most unique business cards in the industry. These cards are not like your ordinary foil stamping, no need to create expensive dies or stamping. The foil is directly into the ink and printed where you need it.